The Wells Fargo branch in downtown Albany last spring before it closed later, in the summer. Officially, it’s the Albany Revitalization Agency, the urban renewal agency running the Central Albany Revitalization Area, that is purchasing the site. But the agency and the council are the very same seven people, and the ARA is an agency of the city government. On county tax records, the property has been shown to have a market value of about $1.1 million. It was built in 1916 by the First National Bank and originally had five floors. The top floors were taken down some time before the 1970s. In 2011, a “refinement plan” adopted to augment the original CARA urban renewal plan identified the bank property as the “Albany Plaza,” meant to be a gathering place of some kind. But the CARA advisory board, consisting of the council and seven other members, has had no recent discussions, at least in public, about how the now-vacant property might be used, or whether it should be in public ownership or sold to some entity under a development agreement. 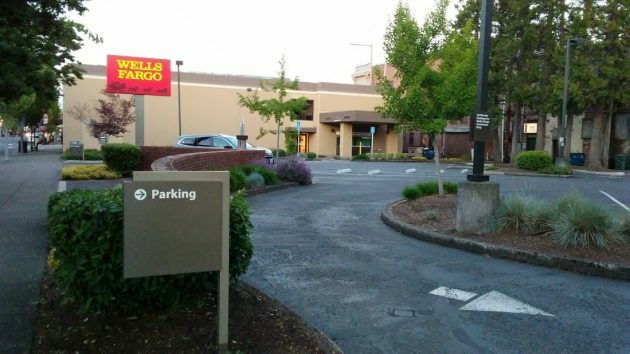 The Wells Fargo parking lot, shown last spring, makes the property especially important to downtown. A page from the 2011 plan that shows the bank property as Albany Plaza. Hope the plan works out. Also hope there was a good reason to pay that much for it, other than the owner knowing they (we?) wanted it and taking advantage of that. Can’t imagine it’s really that desirable of commercial real estate right now. What is the vision for the east anchor? CARA uses Tax Increment Financing under the theory that a “public investment” will increase private property values and the amount of tax revenue the properties generate. But in this transaction, the use of TIF takes a privately owned property that generates tax revenue off the roll and now the property generates zero tax revenue. And the City Manager promises a “development offering” that will deliver manna from heaven in about 30 years to the coffers of local governments? Is that the logic here? Are you asserting that without a public subsidy, private development won’t occur on this property? If yes, I call BS on CARA. If no, then the private marketplace should determine the best use of this property. Does CARA know better than the free market? Please explain your reasoning. I wouldn’t mind some rational on this question as well. Is CARA buying and selling in an effort to make the city’s tax revenue higher long run, then values returned to tax rolls. How is value “returned to the tax rolls” ? IS CARA utilizing bonds as a way to skirt this being investment allocated?? I thought gov entities were not to play investors with tax payer revenue? Anyone care to explain further? Good luck with answers to your questions. You are likely to not get any clarification from either past or present councilors. If you don’t understand, fine. Let me take a shot to help. The short answer is yes. CARA can buy and sell properties to help support the goals of the overall plan. But CARA doesn’t do that very often, spending much of their time and resources to assist property owners improve old properties to make them structurally sound structures, improve their appearance, and increase overall economic viability. That process also tends to make other structures increase in value through normal market processes. It becomes a more attractive place to invest in. Somebody else can help more, I have an appointment. This kind of pretzel logic is akin to Trump’s assertion that increased revenues resulting from a new NAFTA will pay for his wall. The parallels are stunning. The City’s Long Range Planning team has one person on it. Tell me how that makes sense. I see a lot of value in the parking lot that comes with the building. 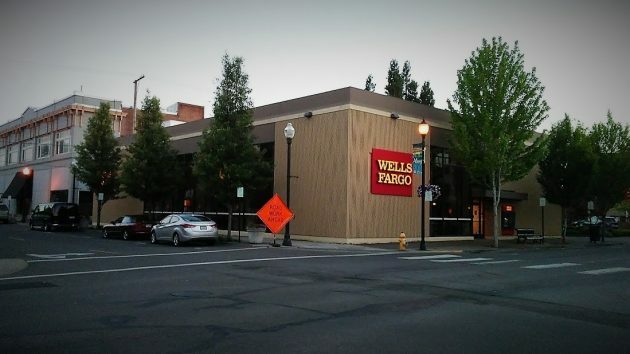 I’m hoping the city will be able to keep that public parking instead of that becoming a private parking lot and not being available to the public as it was with Wells Fargo. Oh My God! CARA bought it because they could. CARA formed without a vote of the people and they continue to funnel property tax money (paid by the people) into their pet projects. It would be embarrassing for CARA (that is, the city council and mayor…they make up CARA management) to leave that building sitting there. And, no one else wanted to buy it…as it is smack in the middle of a downtown that is there only for a few elites to eat in the pricey restaurants and then buy pricey antiques, etc. in the few stores. Hogwash! Because we have a representative government, we elect folks to make decisions on our behalf. That you and a few others don’t like those decisions, you have the ballot box to change the policy makers. And since there have been multiple changes in mayor, councilors, etc. over the years since the inception of the URD; basically it has been continuing albeit at a glacial pace sometimes IMO. “Hogwash” is not an insult, is it? Yes, Hogwash, is an insult. It clearly states that the person being admonished with the word, hogwash, doesn’t know what they are talking about, according to Kopczynski. Before accusing people of lying based on “hard data,” please cite the hard data. I don’t know if this will satisfy you, but here are some sumbers from a letter published in the ADH on June 4, 2014. At the time we were debating how much CARA should contribute towards the new fire & police buildings. I can provide the Excel spreadsheet with the numbers and sources, if you want. The data came directly from county assessor reports. On June 4th the CARA folks will trot out numbers in an attempt to justify their existence. One past number they proclaimed is that the taxable value of the CARA Area has grown by at least 46% since 2001. At first glance this looks impressive, but single numbers with no context are essentially meaningless. When calculating a real growth rate the first thing we have to do is factor out things that are disconnected from economic activity. For example, Measure 50 increases a property’s assessed value by 3 percent each year regardless of the economy. So we need to remove the M50 effect when calculating a real growth rate. And we need to baseline the growth rate to a timeframe where identifiable CARA spending happened. Given the above methodology and reports available through the Assessor’s office, it is possible to take a snapshot and calculate the cumulative growth rate of the CARA Area between July 2002 and July 2013. In that period the taxable value of all the property in the CARA Area increased from $265,495,808 to $379,268,904 – about 43% cumulative growth. But that number decreases to about 4% when you factor out the M50 effect. And the 4% shrinks even further when you consider that only a portion of the growth can be attributable to CARA handouts. But we’re still left with a single, meaningless number. To add context, let’s compare 4% with what happened in the “rest of Albany.” Using the same methodology, the taxable value of the rest of Albany grew 22% over the same period of time. It is time to declare that CARA has been a failure in manipulating the local economy. Given this reality, CARA funds would be better spent on higher priority essentials like public safety buildings. If this is true, then our Civic Leaders, under the guise of CARA (may not be sued) are grossly underperforming. if Shadle’s numbers are true, the CARA activity can be the result of just a few possibilities. As taxpaying Albanians, everyone should demand a full and complete accounting of CARA actions since its inception. Any tomfoolery or incompetence must have the burning light of truth shown upon it. Those have been available year-after-year via the CARA-ARA meeting minutes, the CARA-ARA budgets, etc. That you and a handful of others continually whine about it year-after-year speaks volumes. Especially in light of the folks actually getting their fingernails dirty have changed multiple times since the URD inception. You mean like the new Fire Dept. & Police Dept. buildings approved by Albany Voters? And what would the results have been had the URD improvements not happened?? The then very blighted core would now be more so…and the values in the negative. Hey, these days, if you’re hitting .250 in the Big Show, you’ll be making a lot of dough. Outside CARA boundaries return 4x as much. Isn’t Kellum and Johnson doing anything to stop this fraud? WARD 3 deserves representation that cares about something other than how quaint downtown looks. The voters? Didn’t they just return two councilors and the mayor to office? And it wasn’t even close. You are very “Trumpian” again, Hasso, in changing the subject. Most people agreeing to run for council are of the same mind regarding CARA as the ones already on council. Not all, but most. And, some councilors always run unopposed. Besides, you know darned well that Cordier is specifically talking about the 80% who voted to put government debt to the vote of the people. There must be some sort of miasma clotting the normally clear-headed Albanian resident. Or some manner of mass mesmerization. Regardless, Hering’s analysis is spot on. The good people of Albany are either pleased by CARA activities, indifferent to said activities or intellectually incapable of understanding what CARA does. Regardless, the electorate continues to return the CARA Paraclete to power year-in and year-Out. The wisdom of the masses prevails despite the Cordier angst. CARA is following all applicable laws (as written) regarding its mission. It is not finding “a way around” them… Prove otherwise. Funny… I’ve always been under the impression that if you do something the “legal way,” it’s a good thing. That’s why we have laws and the processes by which to change them. but then refers to Tom Cordier (someone not self-censoring) as “obtuse” in an earlier post when Tom C expressed an opinion. Revealing your identity apparently does not result in or promote civil conversation as referring to someone as obtuse has meaning that is anything but civil, unless your referring to angular measurement. I should also note that Tom & I had a debate over the merits of CARA on KGAL back on June 19th, 2012 in the “Talks of the Valley” program. This was back when Tom was filing multiple lawsuits to stop CARA from functioning. Unless there are term limits imposed for both the mayor and Councilor positions, I’m afraid that fresh, new thinking will never come to light for issues like CARA or other topics. I’d be interested to know what exactly have been the changes/turnaround for the mayor & Councilor positions since the inception of CARA in 2001 (can someone post a list of names/dates?). It is disingenuous to claim that if you don’t like what’s going on, then simply run for office and change things. I think a better mantra is listen to your constituents that elected you and represent them, not an old ideal. Change comes exceedingly slow when say, one Councilor position has changed hands in an election cycle (as in just recently) and your new idea(s) are stymied by a buttress of existing Councilors and mayor who are too rigid to change or consider new avenues of thought. I think what generally happens is the newly elected person faces intense pressure to go with the established flow, hence no change occurs. I can’t even remember who was mayor prior to Konopa as well as many other councilors who have been there as long or longer than Konopa. Interesting… Every 4 years, you have the opportunity to change the councilor in your Ward. You’re telling me that there’s no one in your Ward willing to step into the arena and help formula policy for the city knowing full well they will be wearing a target on their back? The mayor has to run every 2 years. In my particular case, the day after I was elected, I stated on camera, that I was doing a self-imposed term limit and would not run for re-election in 4 years. Notwithstanding having many-many requests over the ensuing 4 years to run again, I’ve said all along that there are too many good people in Albany who should have the opportunity to have the direct input as a councilor. I know you often criticize those commenting here that do not reveal their true identity, but it is really that person’s business/choice and no one else’s. It may trigger negative (albeit illegal) repercussions in one’s workplace by doing so – I’ve seen it demonstrated before. Therefore, “hiding” is not a realistic tag for someone who chooses anonymity over satisfying your curiosity. It is Hasso’s website and he established the rules. I try to respect and consider others’ comments/ideas whether I know their identity or not. The reason I brought up term limits as a mechanism of change is that I recently looked at Albany’s City Council webpage and noticed that Konopa is listed as serving her 6th consecutive term, Olsen his 6th, and Johnson her 5th. This equates to 12, 24, and 20 consecutive years, respectively, by the time their terms are up for re-election. I seriously doubt much change can be effected with people being in the same positions for these lengths of time. It becomes something of a juggernaut when the same people get re-elected over and over and over and makes it extremely difficult for the non-incumbent to enter the arena and institute new ideas. What was instituted many years or decades ago doesn’t necessarily mean that it should continue (other alternatives DO exist and present themselves with the passage of time), but I think councilor/mayoral decision-making for the last 12-20 years or more is to keep things unchanged regardless of constituent voices. The 80% voter approval Tom C. mentions for requiring voter input before more debt can be accrued, spoke loudly what constituents wanted (can’t think of many examples where a ballot has passed by that margin). It seems pretty clear what voters desired, but I think the council and mayor privately vetoed this, found a legal loophole, and instead circumvented a voter decision. I respect your choice of self-imposed term limits, but I think this needs to be an across-the-board rule for all elected officials, especially those in Congress, many of whom have essentially tenured themselves through financial inertia. I agree with you that there are people in Albany who would make a good mayor or councilor, but the odds are stacked against them from the start making it a difficult choice for someone wanting to step up and meet responsibility and time commitments. A much better chance for non-incumbents would certainly exist if term limits were imposed and I believe new crops of people would enter the mix. I like to think of term limits as “upwelling”, an oceanographic term that brings about positive change and growth by reducing stagnation. Rogue River, Oregon has term limits for their Mayor and councilors. See Sections 8 and 9 of their charter. The same can be done in Albany through the initiative and referendum process (see ORS 250 and Albany’s charter). I suspect Albany voters would support such a measure. Also, check out the charters in Hillsboro, Tigard, Lake Oswego, Oregon City, Milwaukie, and Tualatin. Local Measure 34-247 in Tualatin passed in Nov 2016 with 67% approval. While doing your research, check out the shenanigans of the Tualatin Mayor and city council. I’d expect the same from Albany’s politicians. In the end the Tualatin pols failed and looked very foolish. Some folks have no shame. Typical bald-face lie from you. Prove otherwise. It’s not my “curiosity” for folks using their real name! It’s the fact that people will state their opinion (as is their right), but are not willing to put their name behind it. While I disagree with 99.9% of anything TomC has ever espoused, I give him chops for willing to stand behind them with his name. In that regard only, he has more credibility… I also agree there are possibly valid reasons for folks to self-censor, but that also stifles civil conversation IMO. Of course council looked for a legal way inasmuch as council was against the measure from the get-go. If it was “pretty clear,” as you say, then there wouldn’t be a “legal loophole.” I liken it to my finding the information about abstaining during a vote. The rules were written for all to use. No to term limits. I don’t want good representatives out just because of how long they have been there. I also don’t want bad representatives that are to lazy to win their way in. Ms J, you are absolutely right! And, Konopa has been there since the inception of CARA or shortly thereafter. And, as I said, but I got steamrollered by Kopczynski, those running for council already “worship” CARA. Or, I will agree with you that they, are bullied into worshipping it by the other councilors. I’d forgotten that Konopa was a city councilor for many, many years before she became mayor. According to website information I just looked at, she was a city councilor from 1997-2008 (3 consecutive terms) & mayor from 2009-present (6 consecutive terms & counting). That’s close to a quarter-century. Of course you can’t please every constituent. Elected officials should certainly please the majority of them on specific money issues otherwise you can’t claim to represent them. ” My position was always based on what I honestly felt was in the best interest of the entire community”. And that attitude is why legislators are called bad names. The voters values are supposed to be reflected by their representative; specifically when a popular vote is taken. Your feelings Ray are not important at all and certainly don’t count more than popular votes. You are the reason our Oregon Constitution established the Initiative Petition which states the power belongs to the people not the elected officials. I would support an Albany initiative that imposes term limits for the mayor and councilors and I hope it comes to pass (so to speak). Seems like it would be an easy, uncomplicated initiative that wouldn’t have unforeseen implications which anyone could understand regardless of whether you agree with it or not. It appears many other Oregon cities have done so already. Albany needs upwelling and injection of new trains of thought, not people who have had a stranglehold on mayor and/or councilor positions that refuse to represent the majority of their constituents wishes. If an initiative passes at an 80% clip, the message is VERY clear. The message is certainly NOT “we would rather have the mayor & councilors veto our decision by finding ways around our voting power”. Very disheartening to be informed by a former councilor that if an initiative passes by the vote of the people, overwhelmingly or not, then the initiative’s fate is further determined by whether the council/mayor approve of it or not. That is not democracy at work and may be one reason why voter turnout is usually dismal. It gives one the feeling of ‘what good is my vote when it can be overturned or re-interpreted by the mayor/council’. I can tell you I did not vote for my ward representative to use my voting power against me. I suppose if a term limits initiative is proposed and passed, council and the mayor will detest it only to use another legal loophole to thwart and squash the intent of what voters desired. If it is legal, I have no qualms with that. The rules/law are there for everyone to use. I understand completely and that is the reason I backed a re-vote on the rereational marijuana measure that forced the council to allow it. I never would expect my ward rep to agree with me 100% on all issues, nor would I want them to if they are an effective councilor, life doesn’t give you 100% of anything & it isn’t realistic or possible. The dozens of decisions that are made by my rep in the course of, say a year, through the council/mayoral body that are not voted upon by the general public (thankfully so) are hopefully more or less in line with my ideals. There is no expectation of always in agreement. If I have strong disagreement with my ward rep’s decision on something, yes, I will let them know. However, the issue at hand I’m referencing is the initiative vote that passed at the 80% clip. It was a specific vote, with a specific outcome and THAT is what I would want my rep to agree with at all times by adhering to the voting process and honoring the voter’s decision. Constituents may not always like what council/mayor decisions are in a non-voting context – that’s fine, but the opposite should be true when there are important choices put forth to the entire community on a ballot/initiative. The reason an issue makes it to the voting stage is obvious – the community gets to decide. Ms. J: You are my hero! You can out-write and out-think Kopczynski any day of the week, and you are for the rights of the citizenry. Gordon’s absurd analysis of value appreciation completely fails to account for great growth in housing units and apartments that has occurred since 2000, the vast majority of which is outside CARA. That will clearly raise the cumulative net value of properties within the city limits. Not to mention new schools and lots of other commercial/industrial development that was outside of CARA. The city has not been static like itis inside a bell jar. It changes. CARA has focused on rehabilitation of existing development. 19.6% of all homes in Albany have been built since 2000. Did they discuss and approve this property purchase including the price in a public meeting? It was during a couple of executive sessions (as allowed) for property acquisitions…but the following public portion then simply said ARA was authorizing negotiations for purchase of a site (not named). I don’t think you can take action or make decisions in an executive session. The only decision made was what was announced in the public session after the end of the Executive Decision. Obviously, the discussions leading up to that decision were the subject leading to the decision being made in the Public session. How is that not a public meeting law violation? Because it’s an Executive Session in accordance with the law… Happens with cities, counties, councils, municipal bodies, when in process of property acquisitions among other items that also qualify. Did you make decisions in executive session on a regular basis? No. Most of them are information gathering for a decision to be made at a later time…aka labor negotiations, etc. It’s apparent from many comments that some folks need a civics lesson. While TC seems to want a plebisite on money matters, that’s not how the city government works. Meanwhile, RayK keeps trying to explain how a representative government works. Then comes the term limit discussion. I like the term “upwelling” with regard to talent and ideas, but don’t see it happening. The pool of individuals with the talent and skill to function in local government is pretty small. Term limits will just bring forced turnover.